This recipe is taken from Karen Martini’s recipe in The Age. I used Stevia instead of sugar in the buns and I also grated the rind of an orange instead of using candied orange peel. Really happy with how they turned out, and everyone seems happy with the flavour! 7. Tip the dough onto a clean surface, knock back gently and cut into 12 pieces. Press each piece into the cup of your hand and roll in a circular motion on the bench, or in your hand, to form an even ball. Place the balls on a baking tray spaced about 2cm apart, cover with a damp tea towel and allow to rise and expand so the balls are touching – this could take 20 minutes to 40 minutes depending how warm your kitchen is. 8. 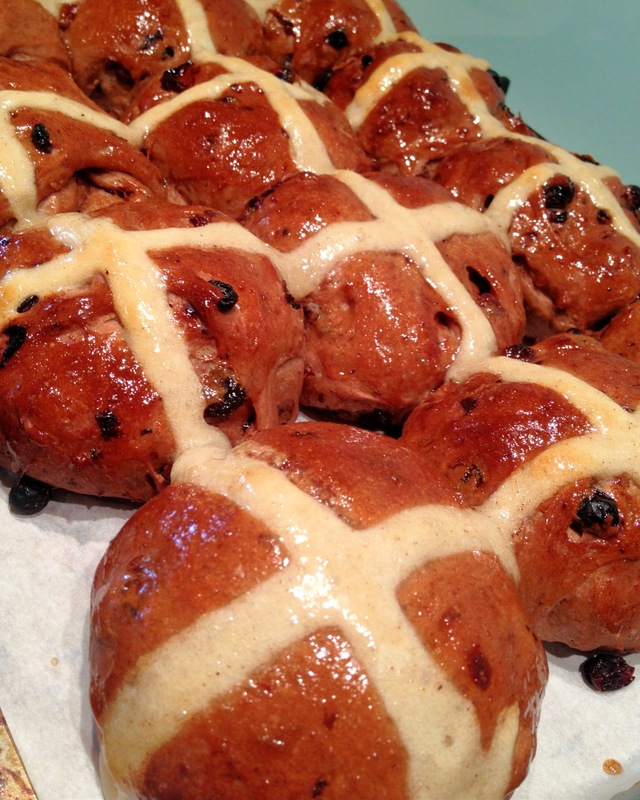 While the buns are rising, make the cross. Whisk the 120g of flour with 120ml of water to a smooth paste – if it’s too sticky add a little more water. Place in a piping bag with a fine nozzle and, once the buns are fully risen, pipe the crosses; it is easier to do this in lines the whole length and width, rather than individually. Tip Don’t halve this recipe as it doesn’t perform well. Just throw extra buns in the freezer or share with your neighbours.